The next ConservativeLA Radio show (on Duane FM in the Hughniverse, Friday night, 08/08/14, 7:00 Pacific/10:00 Eastern) will be the best edition of the show yet, guaranteed. Guest programmer Matthew Berg, AKA @wnyconservative, has gifted us all with a wonderful overview of West Coast Blues, to invoke a short-form description of the genre–and one that doesn’t really do it justice. I think the over-arching theme is of Los Angeles as a key epicenter of urban blues, and of the development of R&B and rock. 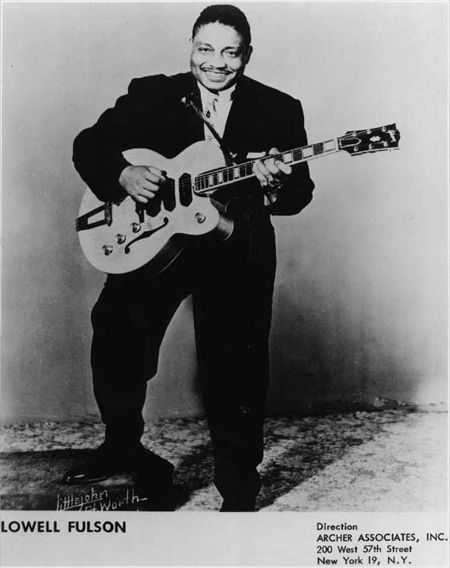 There are a number of clear influences in the music–the adaption of swing to smaller, tighter arrangements; the incorporation of jazz influence (especially w/the bass lines and afro-cuban strains); and the heavy Texas influence, including both boogie woogie piano and the heavier guitar-driven blues. Perhaps the most amazing part of the West Coast Sound – aside from the glorious music, of course – is that it was overwhelmingly driven by musicians who were born elsewhere, as is amply demonstrated by the song selections. A truly magical genre of American music. PLEASE CLICK HERE FOR SHOW POST THAT INCLUDES MATTHEW’S SHOW NOTES. Oh, and the show will be followed by a repeat of my Mystery DJ Show, rather that by the usual musical response by Generalissimo. Banner photo is of Lowell Fulson from a promotional glossy.